It has been almost one month since the standoff started on April 10, 2012 between the Philippines and China at the waters around at Huangyan Island (Scarborough Shoal). This standoff raises a new round of debate on the dispute between China and other claimant states on both the sovereignty and maritime jurisdiction. This article only addresses the impact of China’s U-shape line on the competing maritime claims in the dispute South China Sea. The prevailing basis for China’s historic claims to the SCS （South China Sea） is the U-shaped line (also called nine-dotted line, or nine-dash line) officially drawn on the Chinese map in 1947 by the then–Chinese Nationalist Government, which was originally an “eleven-dotted-line” . After the Communist Party of China took over mainland China and formed the People’s Republic of China in 1949, the line was adopted and revised to nine as endorsed by Zhou Enlai. The line, which has been called a “traditional maritime boundary line”, encloses the main island features of the SCS: the Pratas Islands, the Paracel Islands, the Macclesfield Bank, and the Spratly Islands. No country, including Southeast Asian countries or their past rulers, protested or challenged the validity of the 9-dash line from 1947 to 1970s. There are four schools of thoughts among China’s academies on the interpretation of this line, namely the line of boundary, the line of historic waters, the line of historic rights and the line of ownership of the features. “Line of Boundary” theory simply indicates that the U-shape line defines the limit or extent of China’s territory. The basis of this theory is comparatively weak in international law, and has been criticized even by some Chinese scholars. The Taiwan authorities gave the status of historic water to the water areas within the U-shaped line in 1993 when it issued the SCS Policy Guidelines, which stated that “the SCS area within the historic water limit is the maritime area under the jurisdiction of the Republic of China, in which the Republic of China possesses all rights and interests.” This can be regarded as Taiwan’s official position on the concept of historic waters, though this claim has not acquired unanimous support among Taiwanese scholars. We have to realize that the formulation of the concept of historic waters requires an adjustment of the generally accepted law of the sea regimes. Because of the peculiar circumstances of some maritime areas which fall within the national jurisdiction of coastal states, these areas are allowed to be part of the jurisdictional waters as an exception to the general rule. As early as 1984 the question was asked whether the doctrine of historic bays and historic waters had become obsolete with the development of new, alternative concepts of national maritime expansion such as the EEZ and the continental shelf. Judged by recent State practice, the answer to this question is no. Rather, there is a trend toward the application and assertion of historic claims whether to bays, waters or rights in spite of the establishment of new legal concepts such as the EEZ and continental shelf in the law of the sea. Such a trend may eventually help to codify the rules of historic rights and/or historic waters in general international law. There also exists the separable term of ‘historic rights’ — normally in high seas areas, but without any connotations as to sovereignty in the locale, such as historic fishing rights. The 2006 Barbados/Trinidad and Tobago Arbitration case entails the argument of historic rights of fishing. The term ‘historic rights’ is broader than that of ‘historic waters’. In its widest sense, it implies that a State claiming to exercise certain jurisdictional rights in what usually basically satisfy the same, or at least similar, supposed requirements for establishing ‘historic waters’ claims per se, particularly those of continuous and long usage with the acquiescence of relevant other States. For example, in the Tunisian pleadings in Tunisia/Libya, it was, in effect, argued that historic rights were claimable on a similar basis to that relation to historic waters, namely that they were established by exercise of peaceable and continued sovereignty, with prolonged toleration on the part of other States. Currently, the theory of “sovereignty + UNCLOS + historic rights” prevails among the Chinese scholars. According to this theory, China enjoys sovereignty over all the features within this line, and enjoys sovereign right and jurisdiction, defined by the UNCLOS, for instance, EEZ and continental shelf when the certain features fulfill the legal definition of Island Regime under Article 121 of UNCLOS. In addition to that, China enjoys certain historic rights within this line, such as fishing rights, navigation rights and priority rights of resource development. The presence of historic concepts may affect the drawing of a maritime boundary. The delimitation of the territorial sea specifically requires an adjustment of the median line where it is necessary to take account of “historic title or other special circumstances”. The relevance of claimed historic rights to maritime delimitation of the expanded maritime zones such as EEZ and the continental shelf remains somewhat unclear in the light of case law, though State practice in recent times suggests that historic rights, even if considered irrelevant to delimitation issues, may still be independently taken into account by special agreement as to access. Since there are no definitive rules in international law which govern the status of maritime historic rights, China’s claim is not a violation of international law. Similarly, since there are no such rules, it is doubtful whether China’s claim could be established in international law. What is more problematic is China’s implementation of what it has claimed in the SCS or elsewhere where China may assert historic rights and interests. As the ICJ once stated, general international law does not provide for a single ‘regime’ of historic waters or historic bays, but only for a particular regime for each of several specific, generally recognized cases of historic waters or historic bays. From this point of view, China’s claim can be regarded as one of these particular cases, which may stand up in international law as doctrine evolved over time. 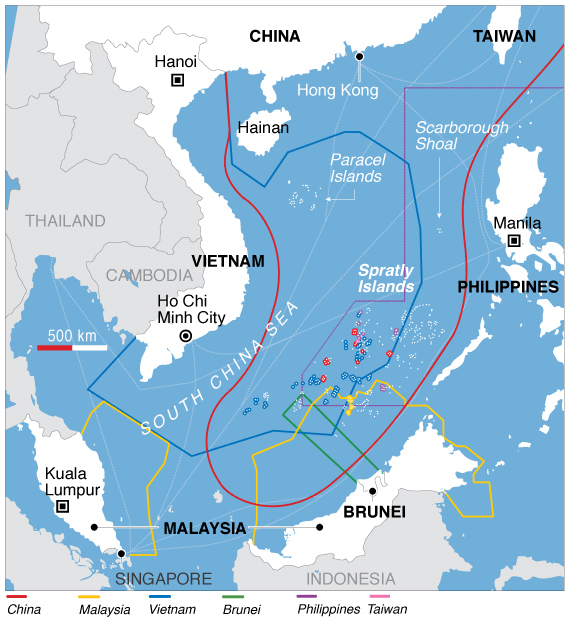 China’s historical claim in the SCS based on the ‘U-shaped line’ overlaps with the claims to EEZ and continental shelf areas of Vietnam, Indonesia, Malaysia, Brunei and the Philippines. The perceived excessive claims put forward by other SCS countries, such as the Philippines and Malaysia, who have claimed some islands in the SCS based upon the 200 nautical mile EEZ rights of UNCLOS, may have encouraged China to insist that its SCS claim is based upon the U-shaped line. In China’s view, a claim derived from historic rights may seem more forceful and valid in law than claims simply based upon the EEZ concept. A balance is needed between historic claims and modern claims under the UNCLOS. Compulsory dispute settlement under Section 2 in Part XV of UNCLOS is available for States for disputes relating to the delimitation of the territorial sea, EEZ, continental shelf, and to historic title unless States have opted to exclude these disputes by virtue of Article 298 (1) (a). Declarations permitted under Article 298 relate first, to maritime delimitation disputes in relation to the territorial sea, EEZ or continental shelf of States with opposite or adjacent coasts, as well as disputes involving historic bays or title. Chin made a declaration in 2006 under Article 298 (1) (a) of UNCLOS. in particular by undertaking regular and intensified law enforcement patrols in the South China Sea within the line. The U-shaped Line map issued by China is a strong evidence for China; however, China needs to address its formal position and clarification of this map, in order to avoid the misunderstanding on China’s position on the South China Sea dispute.